Wood is still a popular choice, but new technologies are making composites more attractive and sustainable. A DECK ISN'T JUST an appendage on a house. Decks blur the barrier between indoor and outdoor living. There are myriad sustainable decking and railing options to consider, from classic wood to the scores of new composite decking materials. Many of these incorporate recycled substances that would have otherwise ended up in the landfill, including carpet fibers, plastics, rice husks, bamboo and wood flour. 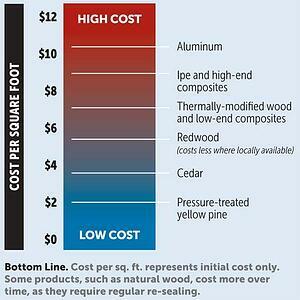 Cost Comparison Certain woods are more expensive than others, and composite decking ranges in price, as well. While some composite decking may be more expensive initially, its low maintenance may outweigh the initial upfront costs over the lifespan of the deck. This chart provides a very general cost comparison of various decking materials. The fastener system, labor, accessories and railing will all impact the final installed cost. Although composite decking is gaining in popularity, natural wood decking is still the most attractive option for about 70 percent of homeowners, according to Mike Beaudry, executive vice president of the North American Deck and Railing Association, or NADRA. The sustainability advantages of wood are many: wood is nontoxic and is a natural, renewable resource; in fact, it sequesters carbon. It can be recycled and regenerated, and it biodegrades without any polluting byproducts. For the truly eco-conscious, softwoods are more sustainable than hardwoods, as they have a much more rapid regrowth rate. The journey by which the wood arrives at the lumber dealer is something else to take into account, as ordering wood decking from a distant source creates a bigger carbon footprint. Choosing lumber certified by a third party ensures the wood was sutainably harvested; however, standards vary. The Forest Stewardship Council (FSC) maintains stricter and more comprehensive standards than the Sustainable Forestry Initiative (SFI). Issues with natural wood decking include vulnerability to hungry insects and rot, as well as the frequency and cost of general maintenance. Wood decks should be thoroughly cleaned annually, and should be refinished as soon as the color starts to fade—usually every few years. Preferences vary by region. Ipe (also called Brazilian walnut), cedar and redwood are three of the most common wood decking materials, particularly in the West; Southern yellow pine and fir are popular in the East and South. Ipe is a very dense hardwood that grows in Central and South America. The extremely tight grain and amber-brown hues make it a popular choice; it’s also one of the most expensive. 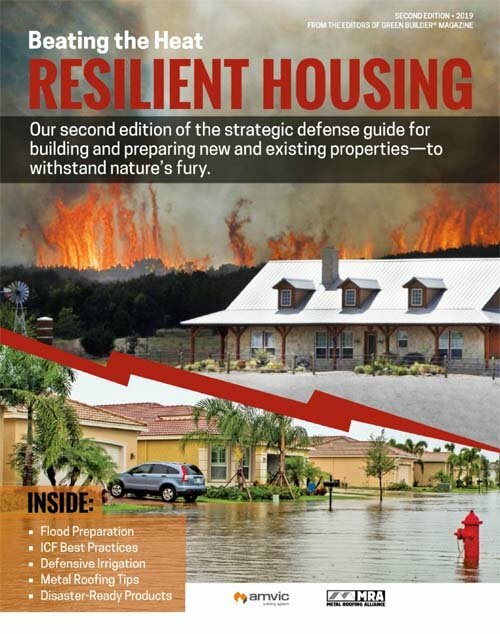 Ipe is naturally durable, rot and insect resistant—one industry group claims it will last 40-plus years—and its fire rating is comparable to concrete and steel. However, not all ipe is sustainably harvested. Ipe is abundant in Bolivia, which has made good progress in achieving FSC certification for its forests. Softer woods such as cedar need to be resealed regularly, or a once-gleaming deck can fade quickly; however, the rich red tones of cedar will eventually turn a pleasant weathered gray, no matter what. Softwoods are not as scratch resistant as harder woods, but they also do not absorb much moisture, and therefore tend not to warp and twist. Cedar harvested in Canada may be certified by the Canadian Standards Association (CSA), but again, FSC standards are more rigorous. California redwood, valued for its beauty and longevity, is a near-perfect decking material, but the species has been devastated by overharvesting. Today, all redwood decking is FSC certified; the California Redwood Association and American Wood Council have also collaborated on an Environmental Product Declaration for redwood decking. The material is costly, but more affordable where it is locally available. Pressure-treated decking, often Southern yellow pine, is the least expensive wood decking choice, but depending on the grade, it can also be the least aesthetically pleasing. Even though newer treatments are less toxic than chromated copper arsenate (CCA), they show a greater tendency to leach copper, which can harm aquatic ecosystems (see Sidebar above). Pressure-treated lumber can contain knots and often arrives at the lumberyard “wet,” which makes it prone to twisting and warping, so make sure to choose material that has been adequately dried. Pressure treating wood involves impregnating the wood fibers with a chemical preservative, which makes the wood resistant to insects and fungal decay. Most decks include some amount of pressure-treated wood, especially for structural elements that may come into contact with the ground. In the past, almost all deck lumber was impregnated with CCA (chromated copper arsenate) preservative. In the early 2000s, the industry transitioned to newer preservatives, such as copper azole, alkaline copper quaternary and sodium borate. Wood treated with these preservatives is available under various brand names, such as Wolmanized Residential Outdoor Wood (treated with copper azole and Baramine, a fungicide that kills copper-tolerant fungi). These newer formulations leach copper more easily, although third-party testing shows that the even more recently-developed “micronized” copper compounds leach much less (http://bit.ly/1AHf6wr). In any case, the industry recommends hot-dip galvanized or stainless steel fasteners for use with treated wood. As of now, there are few substitutes for structural lumber for decking. Composites are not rated for structure, but composite manufacturer Trex does offer Elevations, its coated steel substructure system. Viance offers EcoLife, a non-metallic, carbon-based wood preservative and stabilizer system. Borate treatments, which are non-toxic to mammals, represent a promising option, but current formulations leach readily when they come into contact with water or wet soil. Southern cypress, which grows in wetlands in the Southeastern U.S., is gaining popularity as a decking choice in the South. Thanks to a compound called cypressene, cypress heartwood is naturally rot resistant and does not require pressure treating. Black locust is another naturally rot-resistant domestic species that is earning supporters. Native to the Appalachian region, the dense hardwood is considered an invasive species by many, as it tends to root sprout and form groves. 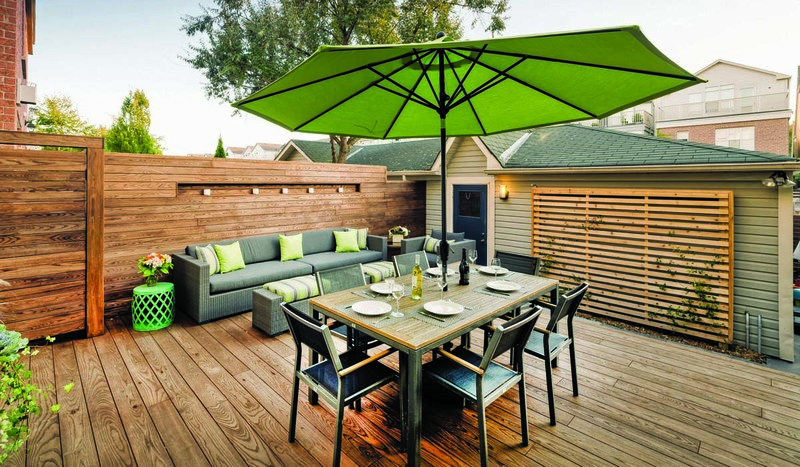 Some wood-based decking material is engineered before it reaches the consumer. “Thermally modified” wood may represent an up-and-coming contender for untreated wood and composites, and which boasts the advantages of both. The process uses heat and steam to remove organic compounds from wood cells that serve as food for insects and fungi. The process decreases the wood’s ability to absorb moisture, making it more dimensionally stable. It also darkens the wood’s tones, so that light-colored species resemble certain exotic hardwoods. Thermal modification has been used in Europe since the mid-1990s, but is just now becoming known in the States. One of the first companies to offer the product here was Thermory. The company uses American ash, but the lumber is treated in Europe. A few companies are starting to use domestically-harvested trees treated in the U.S. EcoVantage, based in Indiana, offers its EcoPrem wood products, including decking, made from thermally-modified yellow pine. 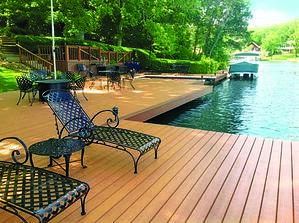 Minnesota-based Arbor Wood Company offers thermally-modified decking made from red oak or ash—two species typically not used in outdoor applications. All of their lumber comes from FSC-certified sources. Acetylated wood is another option. 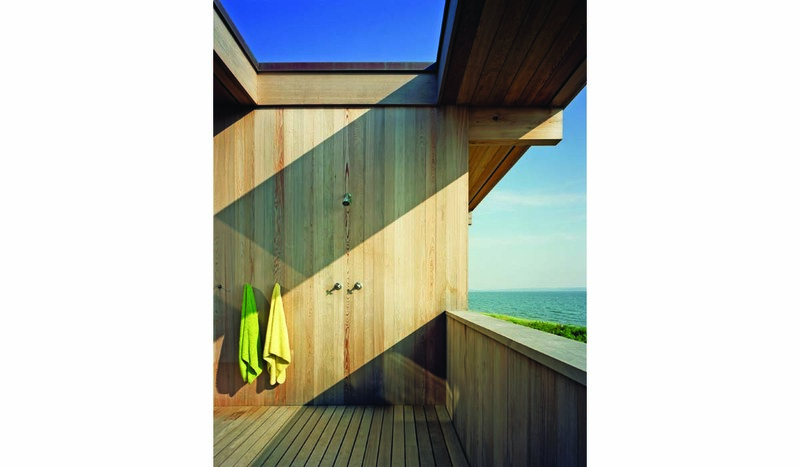 In this process, wood reacts with acetic anhydride (derived from concentrated vinegar), making it water resistant and more dimensionally stable. Accys Technologies offers acetylated wood under the brand name Accoya. As for cost, modified wood is comparable to the low end of the composites, plus it is stable, will not attract insects, is rot resistant and does not absorb moisture. On the down side, thermally modified wood is somewhat more brittle and prone to splintering, and it releases super-fine dust when sawn. Some companies are working to create processed wood products that release nontoxic dust. Beaudry predicts that this category is set for a growth period, while the market for “wet” woods will shrink in the coming years. 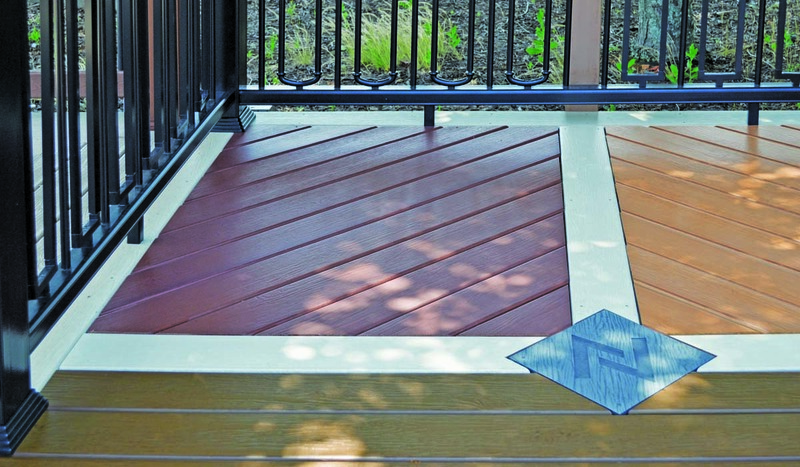 Composite decking is usually comprised of a mix of wood and plastic materials, bound by resins. 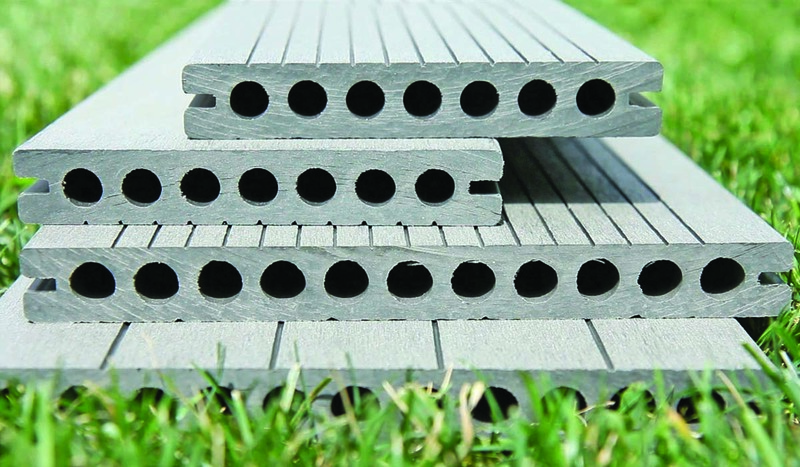 There is a great variety of composite decking made from recycled content, and more options are likely to make an appearance in the near future. 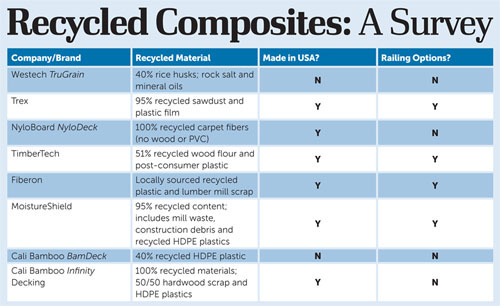 While they haven’t outmaneuvered wood, composites are here to stay. They are made through either an extrusion method or a compression molding technique. Like wood, they range from lower-end to middle-grade to high-end. 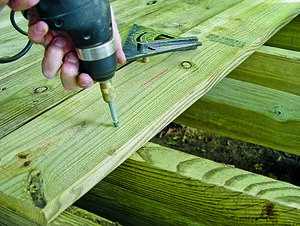 Several companies offer grooved decking boards, which can be used with hidden fasteners; some also offer proprietary clips or other hidden fasteners. Capped composites, which include a protective PVC layer over a composite core, are better at resisting mold and mildew, and are generally more expensive. 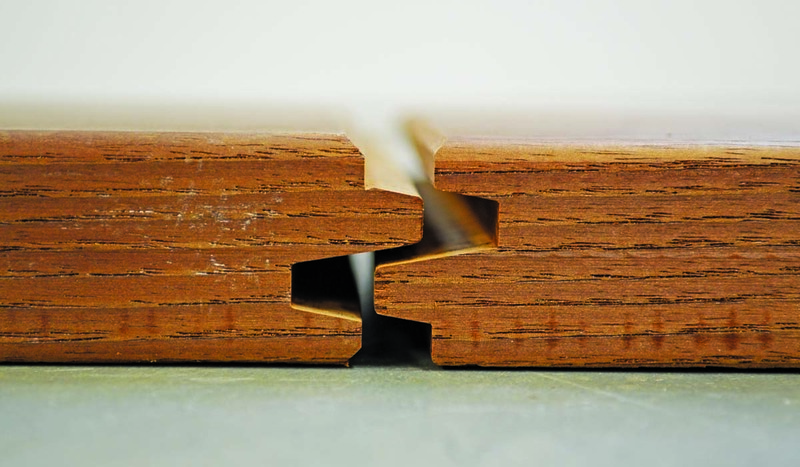 Some companies makes both composites and capped composites; for example, TimberTech offers its Earthwood Evolution series of capped composites along with three plain composite options. As of 2014, Trex, which many recognize as one of the pioneers of composite decking, only offers “new-generation” composites, which include a high-performance PVC shell. The recycled content varies from product to product. NyloBoard, for example, is made from 100 percent recycled carpet fibers; Cali Bamboo’s BamDeck is made of 60 percent reclaimed bamboo fibers and 40 percent recycled HDPE plastics. Trex products consist of 95 percent recycled wood (sawdust) and recycled plastic film. Westech’s TruGrain, made with Resysta, contains 40 percent rice husks, combined with salt and mineral oil. Apart from using renewable resources, one major advantage to composite decking is that it’s incredibly durable. 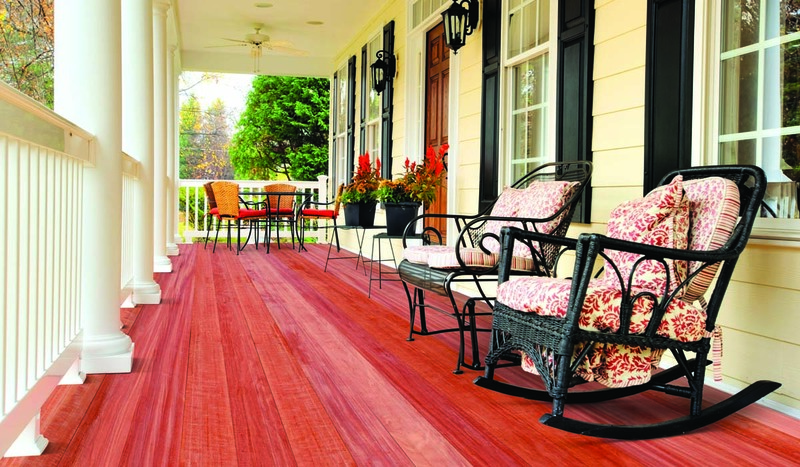 Unlike its wood counterparts, composite decking resists splintering or swelling, and is impervious to rot and insects. Composite decking does require regular cleaning to prevent the growth of algae and mildew. Cleaning these decks is easy compared to the staining and sealing required of wood decks; most simply require soap and water. Another major advantage is the color selection. “There is more opportunity to create a custom environment than when just using wood,” says Beaudry. Color fading isn’t a huge issue, especially since the boards are likely to fade uniformly. For the experienced contractor, installing the composite decking is a fairly uncomplicated process, similar to wood, plus there are more design options in laying the deck boards. But, because composites have only been around for 18 years, whether or not they will prove to outlast their 25-year warranties remains to be seen, says James Gunning, East Coast regional manager for Fiberon. “We are doing everything we can to emulate those harsh conditions, but it’s still kind of a question mark,” he says. Some of the products are too new for its longevity to have been accurately evaluated yet. But regardless, we recommend carefully reading manufacturers’ labels before buying and installing and to ensure that the products have been tested. This custom deck, designed and built by Peachtree Decks and Porches, features Fortress railing panels with 6x6 rail posts and rail caps. Fortress Railing Products is launching a vertical cable rail made from pre-galvanized steel with zinc phosphate and DuPont premium powder-coated cross rails. 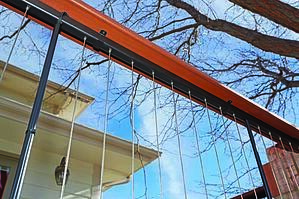 Some designers and builders choose railings in materials that match their decks. 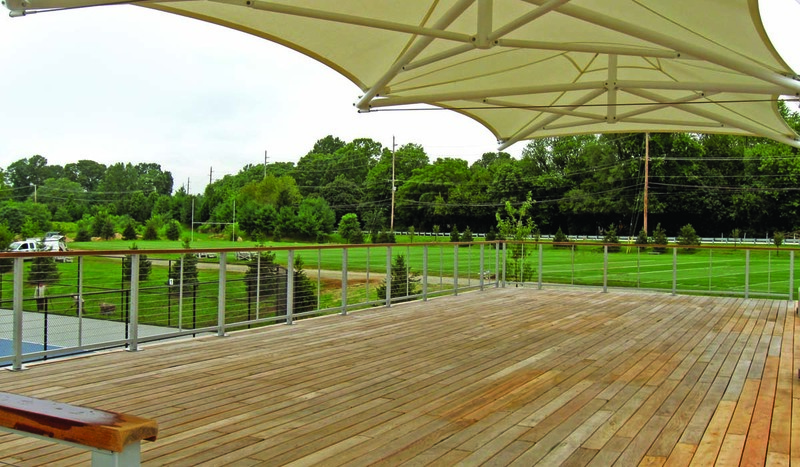 Others prefer to complement decking with other materials, such as glass, steel and aluminum. Metal offers the advantage of durability without the maintenance. Cable railings in particular minimize material use while meeting code requirements, and have the added advantage of enhancing views. Welded wire panels offer a cost-effective alternative. With the proliferation of LED lighting and advances in low-voltage systems, many railing systems now come with state-of-the-art illumination options. Another trend is the ability to add flat rail caps by using rail cap mounting brackets, allowing for an unobstructed view, says Bobby Parks, owner of Peachtree Decks and Porches. “The biggest new change about to hit the market is the vertical cable rail by Fortress,” he says. An industry first, this product comes as a completely assembled panel that is cut to length and dropped into mounting brackets, the same as a metal rail panel. Advantage Lumber sources ipe from managed forests and supports replanting programs. Sustainably harvested black locust decking offers an environmentally friendly alternative to both pressure-treated lumber and exotic hardwoods. Decking and railings made from Southern cypress should be sealed with a penetrating sealer every few years. Companies such as TWP offer low-VOC formulas. The Joint End Matched (JEM) interlocking joints on Thermory decking lock machined ends together, and the seams don’t need to rest on joists. 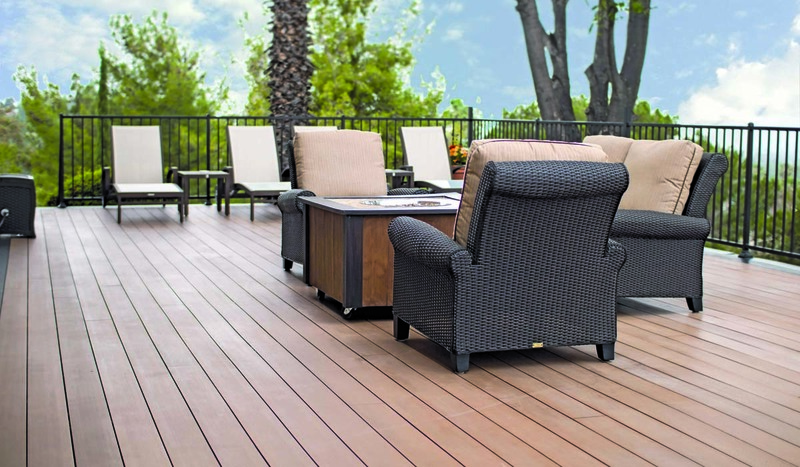 Thermally-modified Thermory decking is made from American ash, but resembles exotic hardwoods. BamDeck, made from recycled plastic and reclaimed bamboo fibers, comes in a double-sided texture and three colors: Slate, Caramel and Coffee. TruGrain decking, made from Resysta, comprised of rice husks, can be stained with over 21 colors ranging from teak to violet. NyloDeck, made from 100 percent recylced carpet fibers, is rated to span joists at 24” on center. It comes in six different colors.